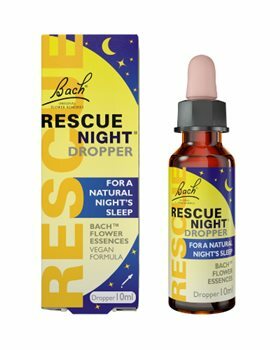 Rescue Night is a combination of the 5 Bach Original Flower Essences contained in Rescue Remedy plus the Bach Original Flower Essence of White Chestnut which has been used to help switch off the mind from unwanted repetitive thought. These flower essences combine to help you enjoy a natural nights sleep. The traditional dropper bottle comes in a 10ml size and is the perfect format to keep at home on your bed side table. It is alcohol free and is suitable for the whole family. For a natural nights sleep. Glycerine, Water and flower essences Helianthemum nummularium, Clemetis vitalba, Impatiens glandulifera, Prunus cerasifera, Ornithogalum umbellatum (Rescue) and Aesculus hippocastanum. Put four drops on the tongue or add 4 drops to water and sip at intervals. I love this stuff. I can't get the alcohol free version sold in the UK here in the US. Sleep rescue - which is sold in the US is 27% alcohol. I hate the shipping cost though.